The former first lady and "Becoming" author explained why it was so important for her to be at the funeral. If there’s one great example of setting partisanship aside in favor of kindness, it’s the friendship between the Obama and Bush families. Today, former first lady and "Becoming" author Michelle Obama further showed her reverence for the former president and his family, announcing that she is canceling a portion of her book tour to attend President George H.W. Bush’s funeral. The 41st president passed away on Friday. 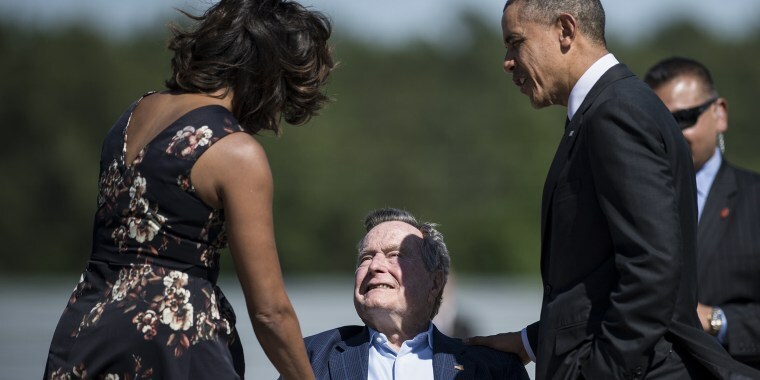 Because of political protocol, Michelle Obama and former president George W. Bush, George H.W. Bush’s eldest son, are seated together at all official functions — a requirement that has seeded the seemingly unlikely friendship between the two families. At Senator John McCain’s funeral, the two shared a quiet moment: a simple exchange of a cough drop that soon after went viral. "He's my partner in crime at every major thing where all the 'formers' gather. So we're together all the time," the former First Lady told TODAY back in October. On Instagram, Obama shared a touching tribute to Bush’s father, sharing a photo of herself and the 41st president in the White House’s Oval Office. “As a public servant, father, and grandfather, President George H.W. Bush was an extraordinary example for us all,” said Obama.